To sanitize or not to sanitize? That is the question…. My opinion is that our (American’s) overuse of antibacterial soap and hand sanitizer has been encouraging bacteria to change and become resistant, and harming us in the meantime. This means it can interfere with your thyroid, and potentially lead to greater problems, including infertility and cancer. What’s the gov doing about these toxins? The FDA is working on regulating and removing triclosan… but only from hand soap and body wash. Their rulings don’t apply to shampoo, lipstick, or other personal care items- most importantly, hand sanitizer! The FDA also doesn’t cover three of the other toxins found in hand sanitizer (benzalkonium chloride, benzethonium chloride and chloroxylenol). And beyond being bad for you, the chemicals in antibacterial soaps and sanitizers are harmful to our environment! Even after being treated, triclosan can stick around and get into our water, harming algae and other sea life. AND, who’s to say that whatever chemical they eventually find to replace triclosan will be any safer? On top of how easy it is to learn how to make your own hand sanitizer spray (chemical free! ), there’s no reason to ever buy the store-bought stuff again! This website contains affiliate links- meaning that if you follow a link to something I recommend, I might receive a small commission at no extra cost to you. I only recommend products I love! More info here. 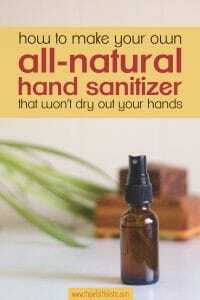 Just say no to antibacterial hand sanitizer! For years, that normal old-fashioned idea of washing your hands with soap and water has been the way to go. It actually cleans stuff off your hands, vs hand sanitizer which just takes care of the bacteria. Not to mention the alcohol dries out your hands- and not just that, it’s dangerous because it removes the good stuff and natural antibacterials on your hands too, which actually leaves you more susceptible to bacteria and viruses! If you have been regularly using hand sanitizer with alcohol and have dry hands as a result, I’d highly recommend a good body butter to remoisturize and nourish your skin to help it heal! But we all know there are times when you just can’t access a sink and want a quick fix to feeling icky. Not that dirt or germs are a bad thing or necessarily harmful… kids actually need some to help develop their immune system! (source) But, ehh, I just feel the need to do something to my hands after I walk out of a bathroom in Mexico that had no running water and no toilet paper. I dunno. Maybe it’s just me. 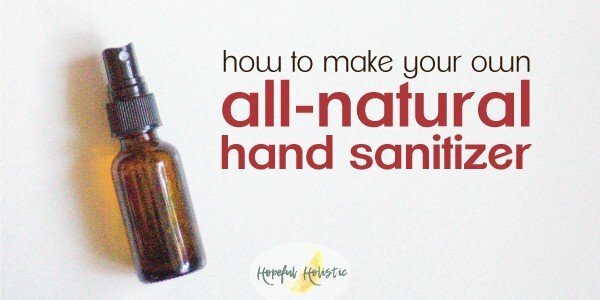 So I learned how to make an easy hand sanitizer at home– and it’s way more simple than I thought! DIY hand sanitizer to the rescue! Just in case you can relate to that feeling of needing to clean your hands but not having a sink handy, hakuna matata! Making your own hand sanitizer is super simple, and DIY costs less than regularly buying Purell or any other hand sanitizer. Plus, this homemade version of hand sanitizer it doesn’t have alcohol in it, so it won’t dry out your hands! And besides- alcohol in hand sanitizer just gives the bacteria one more thing to become immune to. The essential oils listed below can make your hand sanitizer scented, plus they have been studied and been shown to have antibacterial properties. (source) Who needs toxins? 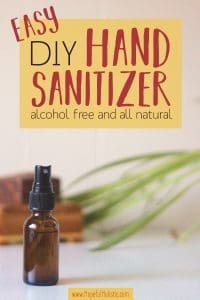 It's super easy to make your own alcohol-free hand sanitizer at home with simple ingredients. Put everything except the water in your spray bottle. Shake to mix ingredients, then add water to fill up the bottle. Shake before using. Antibacterial essential oils: tea tree, citronella, eucalyptus, geranium, lemongrass, orange, patchouli, and peppermint are all good choices. Use tea tree sparingly, some people are sensitive. For smell, you can also use lavender, lemon, rosemary, orange, or vanilla. Store in an airtight container and keep out of reach of kids. It’s alright to store your homemade hand sanitizer in a plastic container since it isn’t purely essential oils, but there is a chance the plastic can break down over time. Since I’m trying to reduce my use of plastic, I put it in this spray bottle and I recommend you do too! This hand sanitizer is alcohol-free and safe for babies, but don’t overuse it. Even though it’s child-safe, kids still need to develop their own protection to the germs in their environment. Use child-safe hand sanitizer sparingly with children. Adults shouldn’t use it multiple times a day either. Vitamin E acts as a preservative and moisturizer. Even purified water can contract pathogens, bacteria, virus, and fungus, and the Vitamin E helps preserve your mixture. The aloe vera is a moisturizer but can be left out if you don’t have any, or it can be substituted with one teaspoon of sea salt. Sea salt has antibacterial properties, and, unlike refined salt, includes minerals that support skin health and help keep your skin hydrated! My favorite blend of essential oils for hand sanitizer is eucalyptus, peppermint, and citronella. These essential oils smell wonderful and are useful sanitizing agents that are safe for your hands! Witch hazel is a critical component of this recipe, because water and oil don’t mix. So many people get this wrong with their recipes that use essential oils… If you add any essential oil straight to water, the essential oil will form little droplets that float on top of the water. Then when you spray it on your hands, you might get straight essential oil, which might burn… We don’t want that! Always add an emulsifier (such as witch hazel or oil) to any essential oil recipe that’s going to go on your skin. And this won’t stain your clothes- feel free to use it as a spritzer or air freshener, and just enjoy the aromatherapy benefits! If you’re interested in other creative ways to use essential oils, you can check out my posts on natural sunburn remedies and how to sleep better! Want to get more toxins out of your home? Hand sanitizer is just the beginning- there are loads of toxins and chemicals that hide out in the products we keep in our houses. But the good news is, you can learn where the toxins are lurking and find good substitutes! 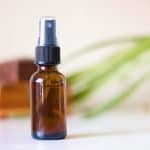 Homemade hand sanitizer spray is one part of holistic living, but if you really want to see benefits, you’ll need to remove toxins from other areas of your life too. It’s possible to do this in small, manageable steps over time. Don’t get overwhelmed- it’s easy and possible for anyone to live more healthfully, and I’m here to help you make steps toward natural living! To get started, download my free guide to reducing toxins by entering your email below!